Taking influence from abundant country fields in Europe, SIX combines the freshest ingredients with a passion for bringing out inherent flavours in a contemporary approach to cuisine. SIX will offer a variety of dining experiences. 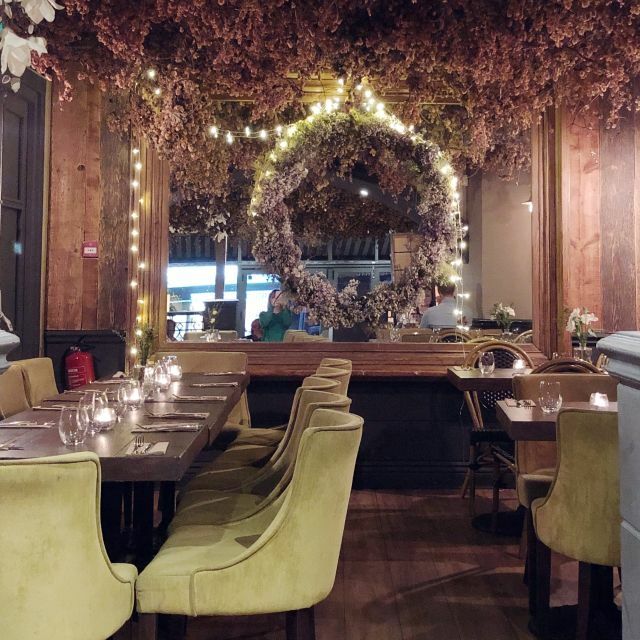 From our intimate and ambient Dining Room, with luxurious design and every romantic detail taken care of, to the more relaxed and informal Brasserie style dining area. SIX is also Brighton"s first cold-pressed cocktail bar, offering a diverse menu of beautifully constructed drinks, along with a selection of the finest organic wines. We will also be serving our own brewed craft beers, made and imported from a small village outside of Ghent in Belgium. 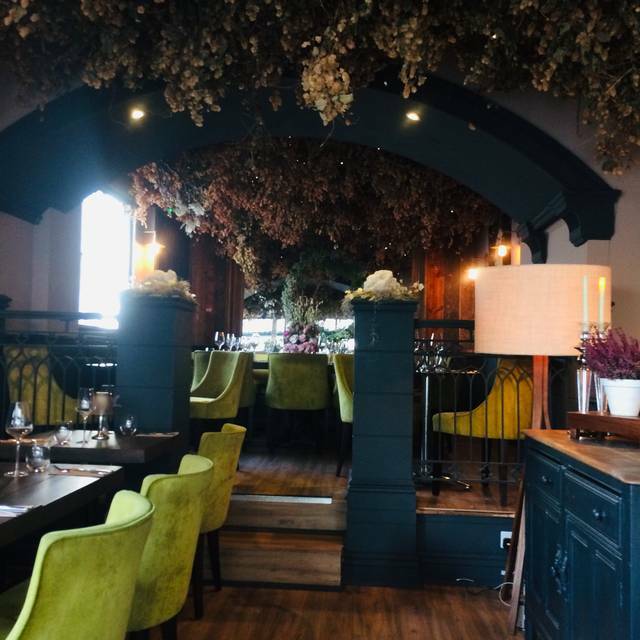 We are committed to solely using locally sourced, organic seasonal ingredients to create our perfectly balanced menus for both our Brasserie and Dining Room. All ingredients are meticulously sourced and supplied directly by local producers to ensure they are of freshest and highest quality available. Lovely food. Great service. We all had the Nutella Lattes, nice but a little bit hyped up. The brunch bowl did not disappoint. So much food that I was not able to finish it! Even though it was busy we had fantastic service and lovely breakfasts. We'll definitely be back. Food was lovely but could have been slightly warmer. Service was good but we felt forgotten about after our main course. Had a 10minute wait for desert menus to arrive after we’d asked for them. Otherwise very nice and would go back. Great time at the bottomless Prosecco, our waiter made sure we were always topped up! Absolutely stunning decor and fabulous food.. loved it and. Can’t wait to go back. Fantastic, will definitely visit again! Great food which is responsibly sourced and excellent service! The Maitre D' ignored us standing at the door for a good few minutes. Nobody acknowledged us. After he did finally meet us he was not warm or friendly at all. The food was OK but not for the price. It generally lacked flavour and I was not expecting bland food as it all read very well on the menu. The good part was dessert, a tasty vegan option for my partner. The cocktails were also fine. Not very impressed with the establishment overall and I wouldn't return. Great staff, food and location!! I will be recommending it to everyone visiting Brighton. We went to Six for brunch and we thoroughly enjoyed our visit. The food was amazing, the services was great. Pleasant meal but not blown away by it, attentive staff improved the experience. Robust and safe but don't expect fireworks. Had a lovely evening here on a Saturday, not too busy or noisy, great venue and nice to see vegan options on the menu. I had the oyster mushroom ‘scallops’ which were delicious! Our waiter was very friendly too! Would definitely recommend. Myself and 4 friends had a great time here last Saturday to celebrate my birthday! We arrived a little early for our reservation but rather than being told to come back a table was found for us next door in the cafe. We returned to the restaurant at the time of our reservation to find our table still occupied. The staff were so apologetic and asked if we could wait at the bar and they would give us a complimentary glass of Prosecco for the inconvenience. The staff couldn’t be more apologetic whilst it took the party around 20 minutes to leave. The table service was brilliant! The food came out really quick and was delicious. We had bottomless Prosecco and I don’t think our glasses were less than half full once! I’ve been to a few places for bottomless brunch and have been left waiting for a top up but not here. The waiter was really friendly and even offered to take a photo for us! I will definitely be back!! Very good brunch was only about £30 each for food and bottomless Prosecco for an hour and a half. The staff were great it looks nice in there and they’re not shy when filling up your glasses. Myself and my friends attended Six for my best friends 21st. We enjoyed our service and were made to feel very welcome and the food was marvellous. Food was delicious and came out quickly. The staff were lovely and the atmosphere was relaxing. Beautiful interior as well. Would definitely reccommend. First class in all areas. Waitress was really good and made us feel looked after. Everything you’d want in a brunch ! I was very disappointed to find a hair in my brunch. Although I was apologised to and I did not pay for it or any of my drinks it has put me off. A lovely Saturday brunch, wonderful service from Xavier who made us feel really special. 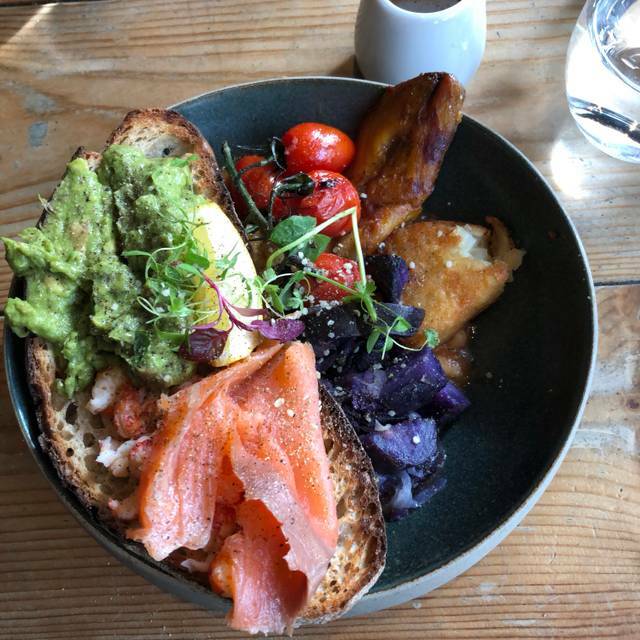 I recommend the pescatarian breakfast bowl, fabulous! Love this place. Great quality, tasty food. Something for everyone- especially good if you have a group with mixed dietary requirements, allergies and/or intolerances. 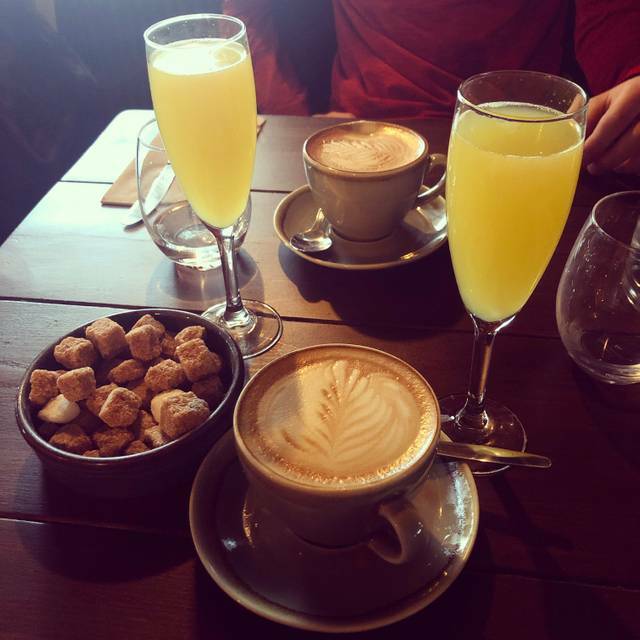 We went for a birthday and did the bottomless brunch, our drinks were always topped up and the food was delicious! Can’t wait to go back! Food was excellent, lots of interesting vegan options, and couldn’t fault the service. Only negative was the yoga studio upstairs, there was constant stream of people walking past the table and chatting, which ruined the ambience a bit, it meant it wasnt very private. Although the food is tasty and wonderfully organic, the portion sizes of our brunch was quite small and I was hungry again about 30 minutes after we finished eating. Also, it seemed as though they didn't have enough staff to properly provide good customer service to each table. We had to ask 2 staff for the check and then ended up going to the main counter to pay as no one came back to our table. Though the staff appeared busy and were running around, there simply just weren't enough to take care of us properly. Shame. Food was really tasty and came out very quickly, service excellent. But... ambiance was lacking, felt like an entrance to a shopping centre. Small food portions for the price and not particularly flavoursome either - all focused on the aesthetic. Everything else great, especially the service and decor! Excellent lunch for 8, the staff were very accommodating for all the various dietary needs. Although with the order a couple of mistakes were made, they service was excellent and a tray of drinks arrived with no question and straight away. Would highly recommended. Decor is nice, but it's really noisy. Service was friendly but very slow, being busy isn't an excuse; get more staff! Food was good apart from the sourdough toast which was rather hard and chewy. Cannot fault the food, very delicious! However the service was appalling which really let it down. I have been twice for bottomless brunch and both times it seems there is not enough staff and the staff seem very stressed which is a shame. Loved it! Would highly recommend visiting Six for a bottomless brunch! Will definitely be returning! Absolutely love the food at Six, my Husband and I both ate from the vegan selection and were blown away. Service was wonderful only thing that let it down was the long delay between courses. But I think this was a one off as I didn't see any other tables having this issue. We look forward to our next visit!